Laboratoire d’Annecy de Physique des Particules - A new LHC milestone ! 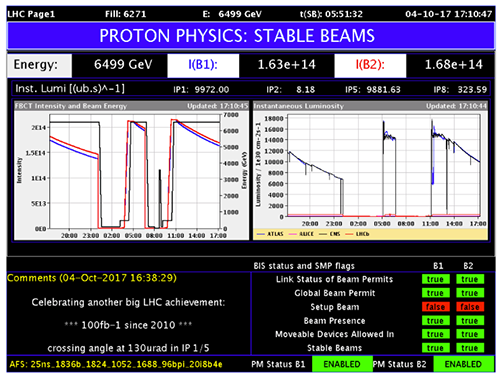 A new LHC milestone ! 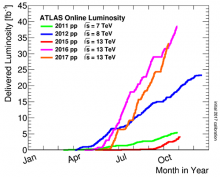 On 4th of October 2017, the Large Hadron Collider (LHC) delivered a total of 100 fb-1 of integrated luminosity (which corresponds to a large quantity of data delivered) to its general purpose experiments ATLAS and CMS. This was a nice present for both experiments which are celebrating their 25th anniversary this week. This milestone follows up other records this year at the LHC, on the luminosity, number of bunches in the beam and number of interactions per beam crossing. A new luminosity record for the LHC of 1.74x1034 cm-2 s-1 has been reached on 10 August 2017. The luminosity is a measure of the number of potential collisions per second and per unit of area. This new peak luminosity surpasses initial expectations defined by the original designs for the LHC, of about 1 x 1034 cm-2 s-1. The beams in the LHC are made up of bunches of protons, containing more than 100 billion protons each and spaced seven metres (25 nanoseconds) apart. On 28 June 2017, LHC reached 2556 proton bunches circulating in each direction of the accelerator, which is the maximum possible number that can be reached with the beam preparation method currently used. LHC is currently running with more than 60 interactions per beam crossing. This makes very challenging conditions for the detector operations which were designed to operate at 25 interactions per beam crossing. 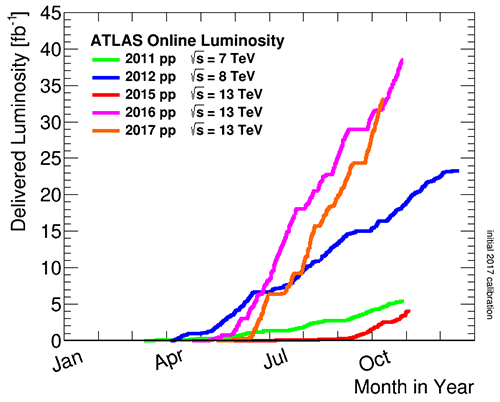 With 27.9 fb-1 of data already recorded by the ATLAS experiment in 2017 and one more month of data taking remaining, ATLAS is well on the track to collect more data this year than its last years’ record of 35.9 fb-1. Every couple of seconds of data taking bring us a new event with Higgs boson, over a thousand events with Z boson and and potentially some new particles waiting to be found. Our experimental team at LAPP is actively participating to the analysis of all this data.